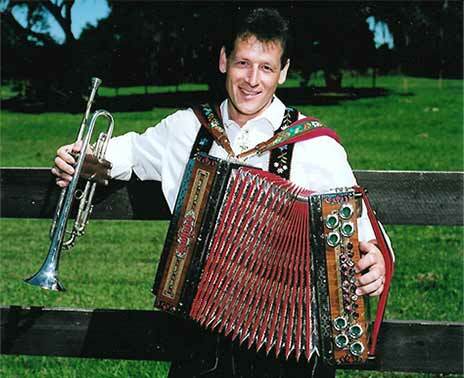 Martin Gross grew up in the Buffalo, New York area, never thinking the ethnic German / Austrian music playing around the house would someday become his livelihood. In 1982, the Walt Disney Company was looking for musicians for a German Biergarten band at EPCOT, so Martin took the “one year” position with the Oktoberfest Musikanten and has been there ever since. He met his lovely wife Waltraud in 1985 while she was working in the Biergarten as an exchange student from Germany. They married in 1987 and now live in Gotha, Florida with their three children Timmy, Stevie and Cindy. Besides performing, Martin enjoys writing and arranging all styles of music and has become very involved with youth soccer in the Central Florida area. Other musicians who have performed with the Sonnenschein Express include Bill Mueller, Ty Baden and Frank Ciavatta on drums, Jim Horzen and Bill Page on Accordion, Gene Hunn, Ted Schoen and Jim Snyder on Clarinet, Hans Prettner on Guitar and George Schnell on Tuba.